Fujifilm announces film discontinuations: another step in the digital takeover of photography. I have for a long time thought that we will end up with black and white film only as the use of colour film is going to wither away as digital completely takes over the world of colour. I personally think that the ability to change and print colour is superior in digital and will continue to get better over time. As this happens we will all use digital and even colour negative films and printing will go this way. There might be the possibility of C-type surviving in commercial photographic labs as this will still be able to captured digitally and manipulated to achieve amazing results in computer before sending to the lab for printing. Whereas darkrooms and Black and White have always been a special place int he mids of photographers as they have been able to manipulate contrast, tone and localised density corrections in the darkroom in a way that is not possible for colour printers without rather specialised and expensive printing techniques. 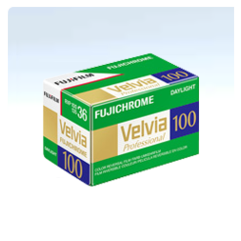 So Fuji closing down Fujichrome Velvia 100F in 35mm, 120 and 4”x5” and Velvia 50 in 4”x5” and 8”x10” films is just another step in this direction that will logically end with all colour film gone and only a small remaining Black and White film collection left to specialist users. This is just my thought of where digital will ultimately lead us to as photographers.